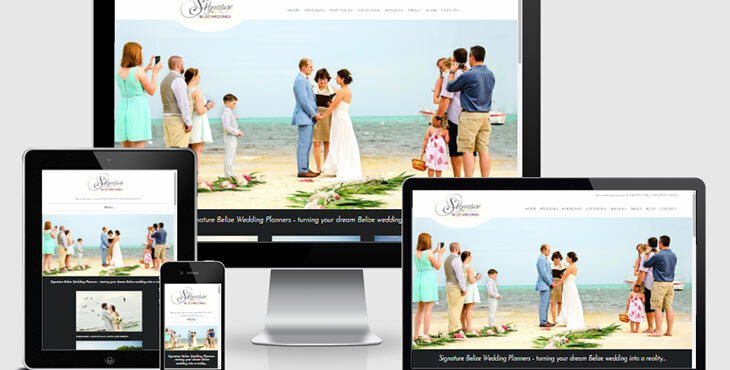 BIM Launches New Website for Signature Belize Weddings! Signature Belize Weddings is every upcoming bride and groom’s dream come true! With over 10 years’ of experience in the wedding industry; Rachael, owner and lead coordinator, will plan your dream wedding from start to finish. The website is image driven with bold, beautiful pictures to give clients visual ideas for their wedding. It also provides a portfolio of various pictures of wedding locations and themes to choose from. This site is fully responsive which makes it easily accessible from any device, be it a smart phone, tablet or desktop. The site provides a more engaging user experience, making all the information readily available at the click of a button and it’s enhanced SEO making it easier to find on the web. To learn more about what Signature Belize Weddings has to offer visit their new site!